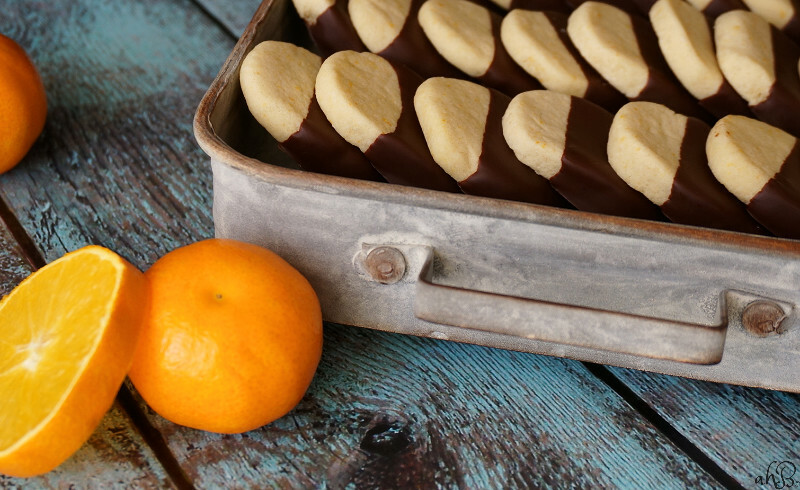 Smooth and rich dark chocolate encases a delicately flavored orange shortbread. Simple flavors and traditional technique are what make these dipped shortbread cookies shine. Not overly sweet, but completely indulgent all the same, these cookies taste much like those candy chocolate oranges you can find this time of year. Though I do love those treats, these cookies were inspired from a different kind of Christmas orange. I spent a lot of time with my paternal grandmother growing up. My parents divorced when I was very young. 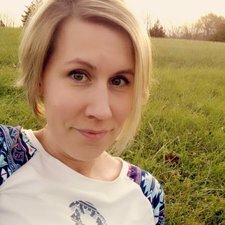 My father didn’t want his visitation rights with my sister and I, but his mother stepped in and took them, ever hopeful that she’d be able to convince him of the error of this ways and that someday he’d want to see us. It never did work out the way she’d hoped. Though she had many flaws as a person, she was an excellent grandmother. Boredom was never allowed on our weekends with grandma. Weather permitting, she’d have us outside plodding through fresh plowed fields in search of arrowheads and pottery shards, fishing or frog hunting, traipsing through the woods as she pointed out every wild flower by name, mushroom hunting and foraging for berries, one time she even cut young green branches from trees and strung us up bows with little whittled arrows to practice archery. If the days had to be spent inside there was always some sort of little project she’d have lined up. T-shirts and puffy paint, needlework or embroidery, and when all else failed to hold our attention, an Atari. At Christmas time, my sister and I were the only grandchildren to have Christmas stockings from Santa at grandma and grandpa’s house. In my naivety, I assumed it was because we were the favorites, now I realize it was an attempt to compensate for the lack of any effort put forth from my father. Every year we knew what would be in our stockings; apples, oranges, nuts and gum. One year I asked her why we got those things and she told me those were the very same treats she’d gotten in her stocking as a little girl. To me they were very dull things for Santa to bring to a kid, but now I love that she passed this little bit of her childhood and her own family’s tradition on to me. The smell of fresh peeled orange mixed with aroma of a real Christmas tree brings a smile to my face as I think about her love of Christmas oranges and is the main reason why I keep a bowl full of them through the winter months. Small traditions like these, though our children may never know the origins, are what keep us tied to our roots and heritage. 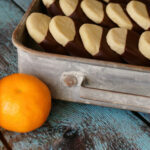 And it was with thoughts of her that I lovingly created this recipe for dark chocolate dipped orange shortbreads. 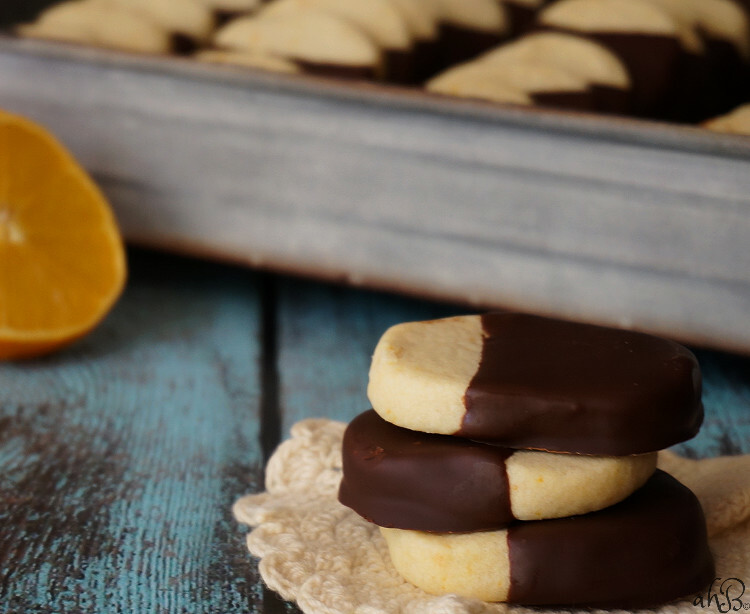 Smooth and rich dark chocolate encases a delicately flavored orange shortbread. Simple flavors and traditional technique are what make these dipped shortbread cookies shine. Whisk together the flour and salt and set aside for later. In a medium sized bowl, cream together the butter and confectioners sugar. Add to this the orange zest and vanilla. Beat until light and fluffy, around 3-5 minutes, scraping down the sides of the bowl when needed. Reduce the mixer speed to low and add in the flour, mix until just combined. Using your hands, press the dough into a ball inside the bowl. Turn out onto a lightly floured surface and knead the dough until is nice and smooth. Roll the dough into log about 12 inches long and 2 inches in diameter. Wrap in waxed paper, tucking the ends under so the dough does not dry out and place in the fridge to chill for 30 minutes. Slice the dough into 1/4 inch slices and place on prepared baking sheets. Bake until firm. 13-17 minutes. Allow to cool completely on wire racks, reserve parchment paper for later use. Melt dark chocolate baking chips in a double boiler. Dip each cookie generously in dark chocolate and place back on parchment paper to dry. Because of the high amount of butter in these cookies, the parchment paper helps absorb some of the extra grease that escapes while cooking, ensuring that your cookies have an even texture throughout and aren't greasy on the bottoms. Ohm thanks for sharing these Amy! 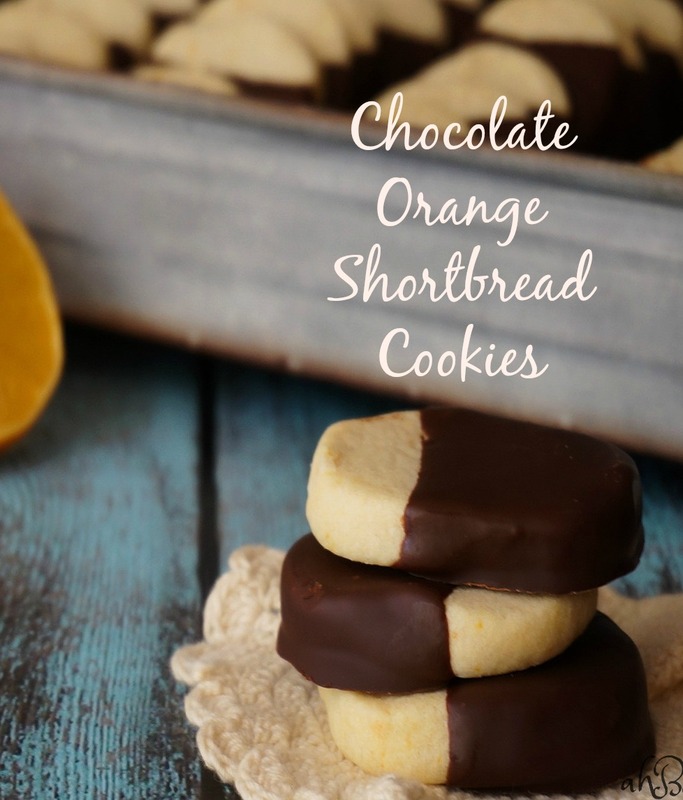 I love chocolate and orange and I love the simplicity of shortbread. You know Chris, I bet it was just as happy memories for her as it was for us. Enjoy the cookies! They’d go perfect with a cup of hot cocoa and a good book. Amy — what wonderful memories and how great that you have this recipe to continue the memories. These sound wonderful! Not sure I will get them made this year for Christmas but help me remember them for next year, please! 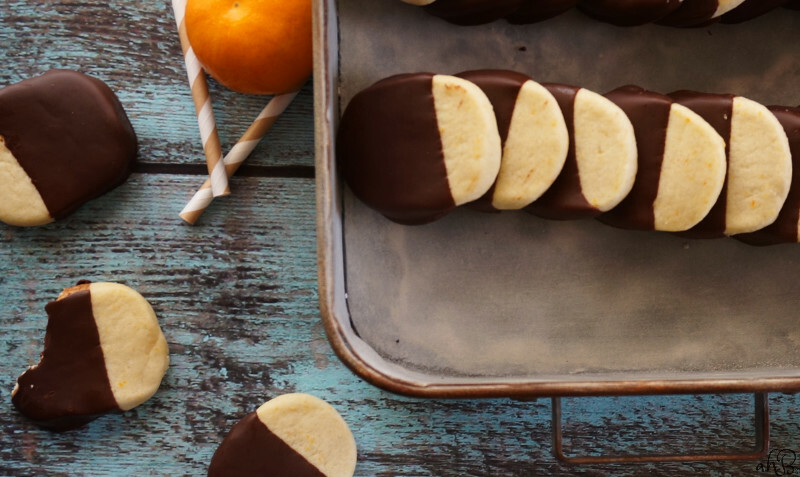 I love shortbread, and chocolate and orange combined — how wonderful these cookies are! Merry Christmas to you! Beautiful! I love any kind of shortbread at Christmastime! I don’t know what it is, but December always has me craving orange and chocolate 🙂 Can’t wait to whip up a batch! 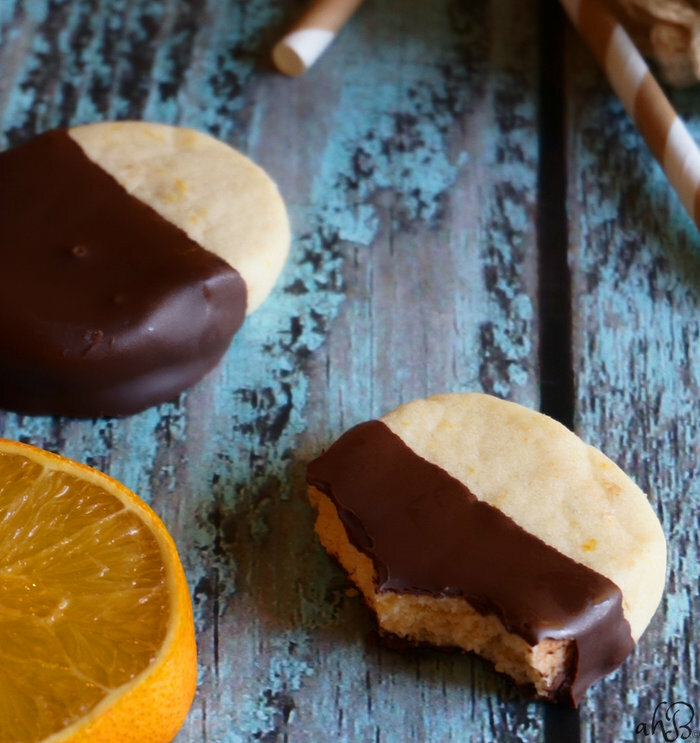 Chocolate and orange is my favorite cookie combination. These are gorgeous! I am not much for chocolate, but orange chocolate I LOVE, so these cookies would be a big hit a my house for sure!